Pete's Box is a custom sugar cookie stash inspired your pal, Pete from Pete's Basement! This special cookie box is available to you in all it's sweet glory with profits from every sale going directly to supporting the Pete's Basement Comic Book Talk Show! Now you can support your type 2 diabetes AND your favorite podcast. Pete's Box LVL 1 contains 5 sugar cookies of gamer geek inspired goodness that include rupees from the Legend of Zelda, a pair of cherries from Pac-Man (or just about any classic arcade game), and a fun Deadpool movie inspired "cockthistle" speech bubble. This special cookie box is available to you in all it's sweet, sweet glory. 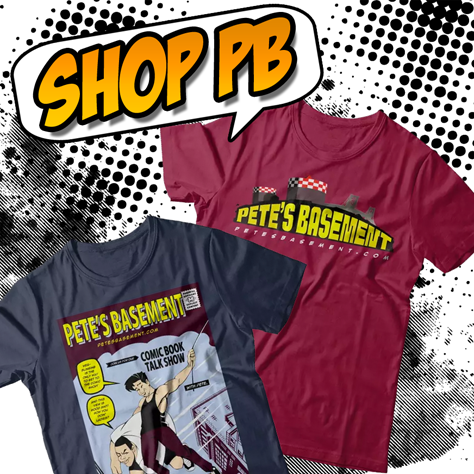 Even more sweet is that every Pete's Box sale goes directly to supporting the Pete's Basement Comic Book Talk Show! Now you can support your type 2 diabetes AND your favorite podcast. Classic Ultimate Vanilla or Chocolate are only two of the sugar cookie flavors available. Other options include Gingerbread, Lemon, Almond, and Gluten Free Vanilla or Chocolate. Have an allergy or dietary restriction? 8 Bit Bakeshop is happy to customize your order for your tastes and needs. 8 Bit Bakeshop will be powering up the Pete's Box up to LVL 5! LVL 1 and LVL 2 are currently available. In the meantime, earn yourself some XP by starting with a LVL 1 Pete's Box to satisfy your geek sweet tooth. And we must say, the vanilla sugar cookies pair well with whisky. Pete's Basement Hall of Patrons - Support The Show!